Pure, creamy organic coconut milk with no sugar or preservatives. Pressed from the flesh of freshly picked coconuts, this has a very versatile, delicately sweet flavour – for adding richness and fragrance to aromatic dals, warming soups and spicy curries. 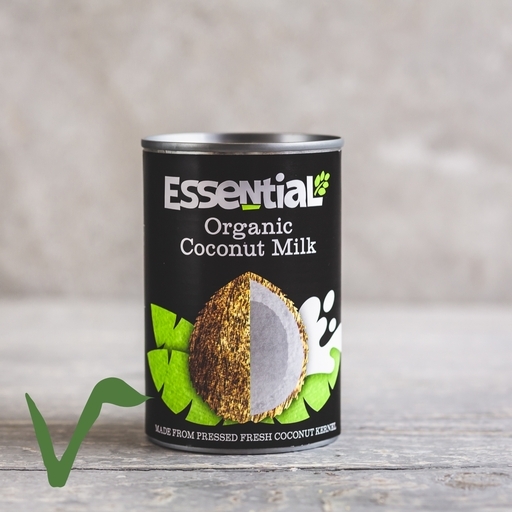 It’s normal for coconut milk to separate in the tin – just stir it together. Use in Asian cooking – as in Indonesian-style pork or Thai squash curry. Coconut milk is also good in dairy-free yogurt and vegan desserts, from rice pudding to ice cream. Drink on its own, use as a base for silky smoothies, or mix with rum and pineapple juice for a decadent pina colada. Use in Asian cooking as a cooling balance to the heat. Coconut milk is also good in dairy-free yogurt and vegan desserts, from rice pudding to ice cream. Drink on its own, use as a base for silky smoothies, or mix with rum and pineapple juice for a decadent pina colada. Tinned coconut milk will last unopened for a long time. Once opened, transfer the milk to a sealable container, keep in the fridge and use within a few days – the high oil content means it’ll go rancid quickly.